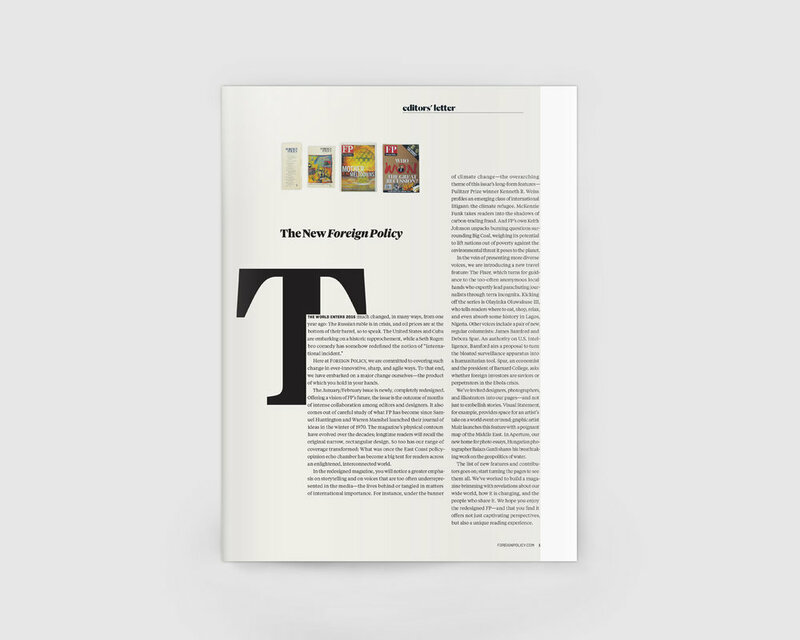 In 2013, I joined Foreign Policy—a DC-based magazine and news website that covers international politics, policy, economics, and culture—as their creative director. 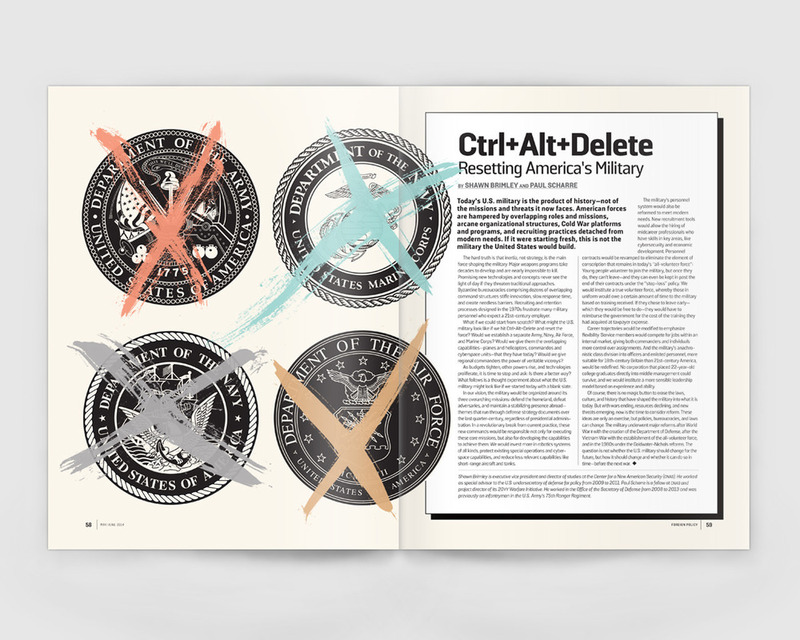 The nearly 45-year-old magazine started as a an academic journal during the Vietnam War era. 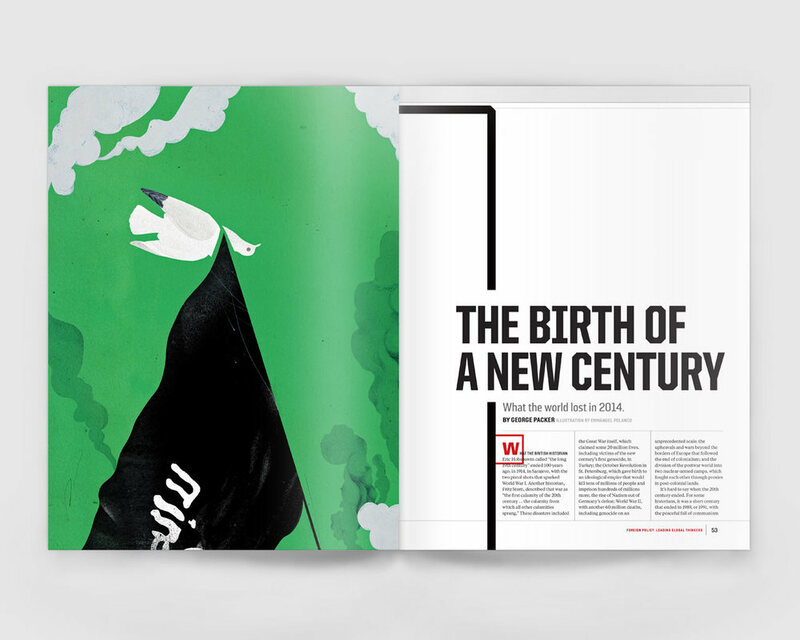 Conceived as an antidote to conventional foreign policy journals of the time, Foreign Policy aspired to be “serious but not scholarly, lively but not glib.” In the 2000s, Foreign Policy morphed into a bi-monthly glossy magazine, taking on a more journalistic and less academic approach. 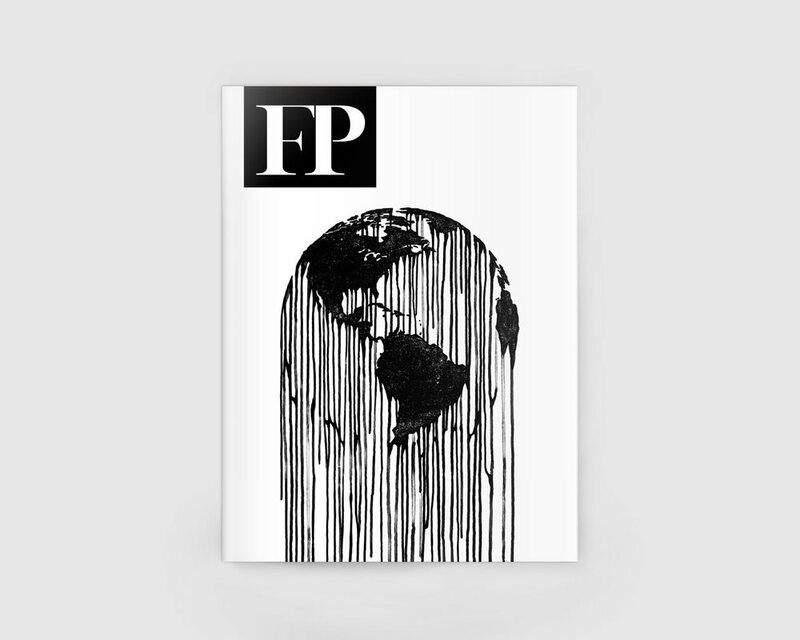 While FP excelled in serious, longform journalism and thoughtful analysis, a magazine with newsweekly/newspaper roots struggled to find its visual niche within the expanding, internationally-minded and sophisticated media landscape. 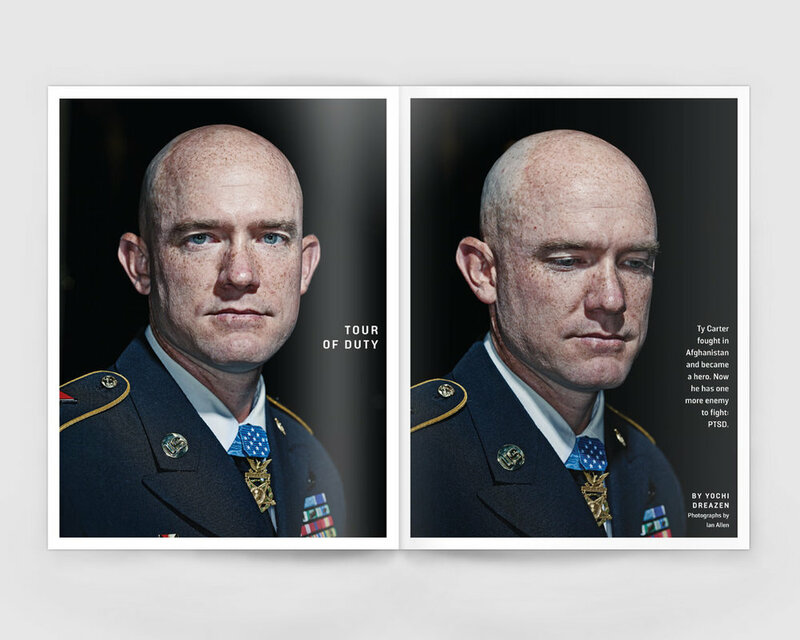 During my tenure I was part of a team that re-launched the website, refreshed and expanded the visual identity, and overhauled the print magazine by introducing new departments, expanding the coverage and emphasis on visually driven storytelling. 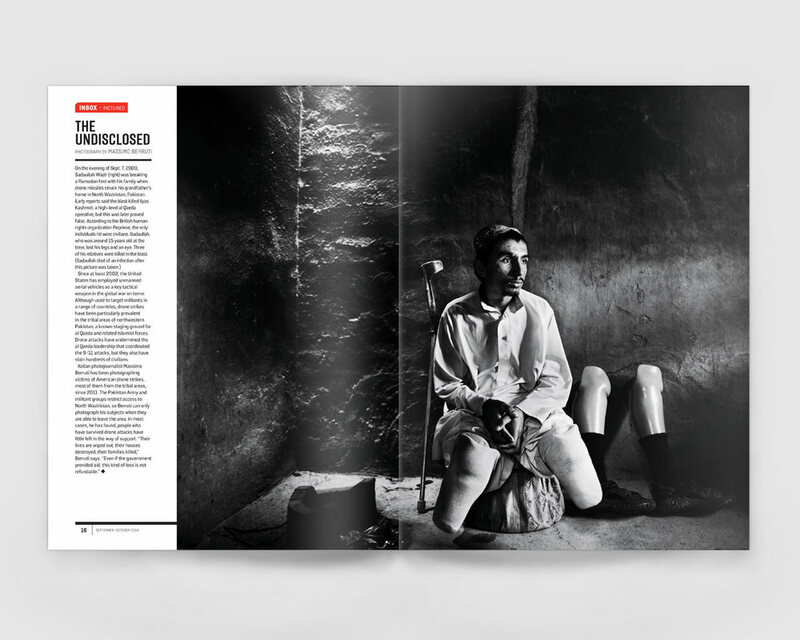 FP was recognized in kind, gaining attention from the design and photojournalism community and winning various awards that FP had never entered before. 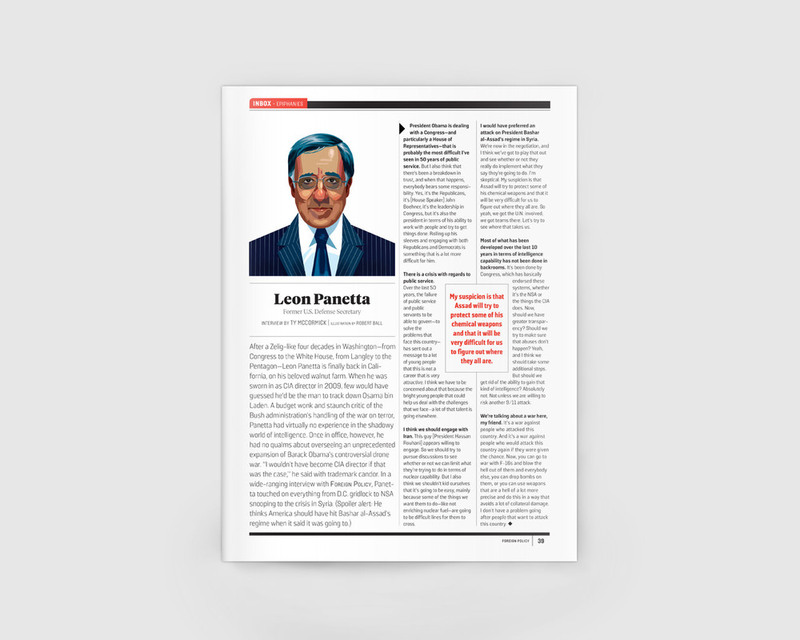 The print magazine hadn’t had a proper redesign since 2000, when it moved from a journal format to a glossy news magazine. 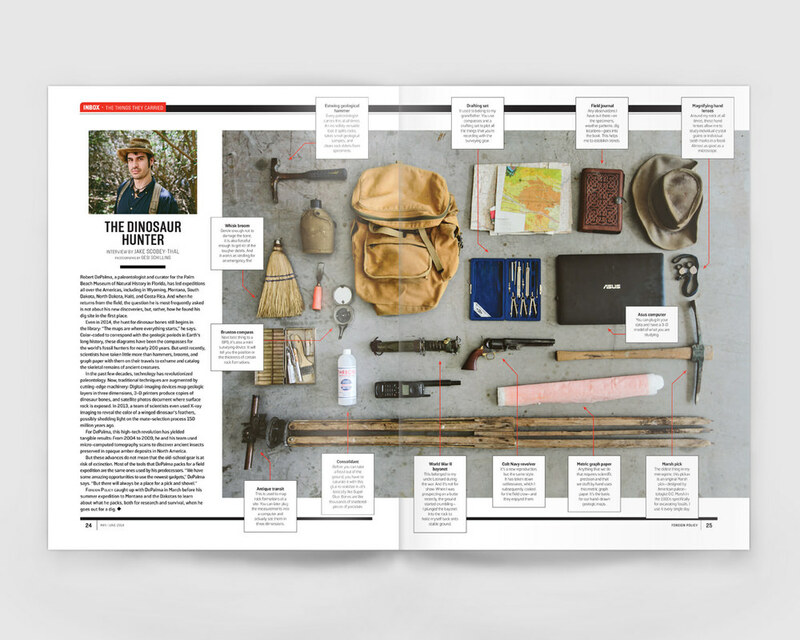 With this in mind, myself and my art director, Ed Johnson, worked with a small team of editors over the summer of 2014 to conceive a new vision for the magazine, which, while keeping the highest quality of journalism throughout the years, had since lost its identity and needed to redefine its core. 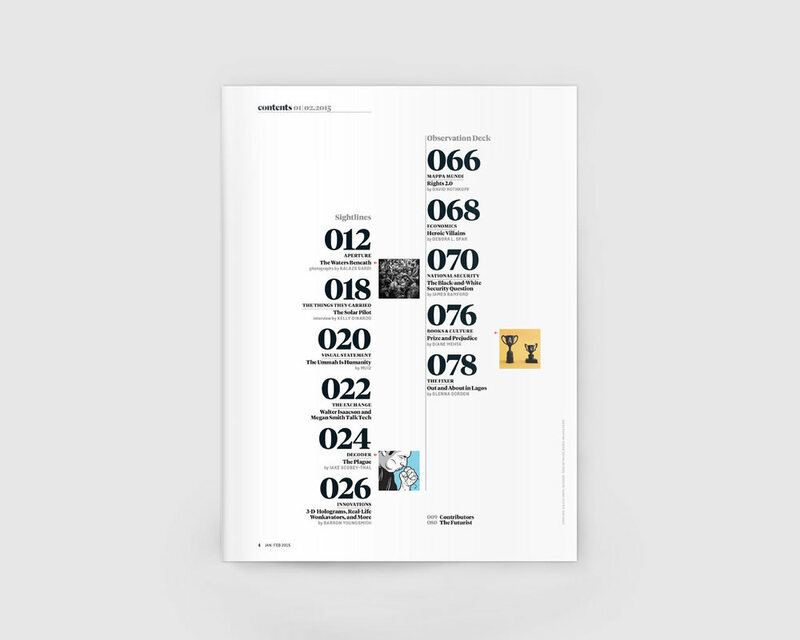 Each issue has three distinct sections, announced by openers, or single-page “splash pages”: the front of book section, “Sightlines”, which gives a quick read to a variety of issues using easy-to-digest formats: infographics, brief explainers, conversational writing. The feature section is now themed, and is introduced by a brief editor’s note to give context. 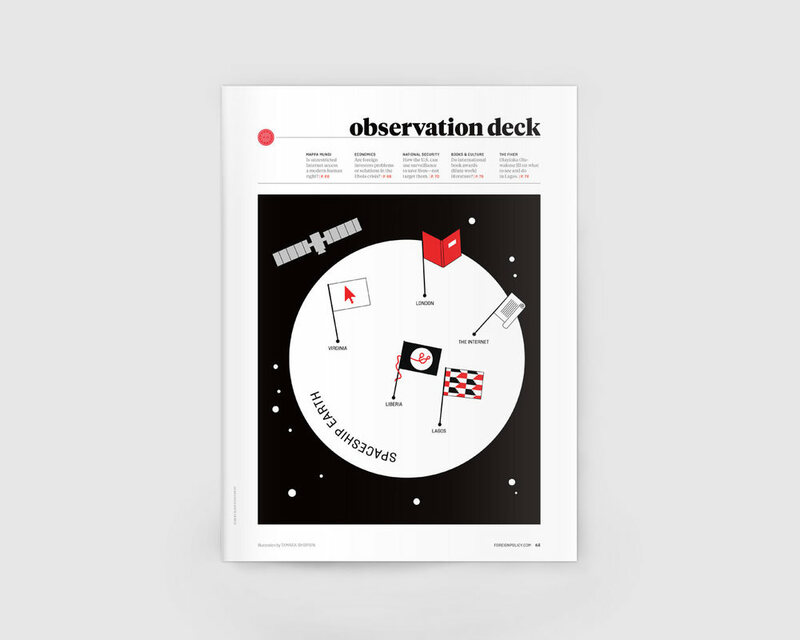 “Observation Deck”, the back of book section, houses opinion and analysis from a variety of vantage points. 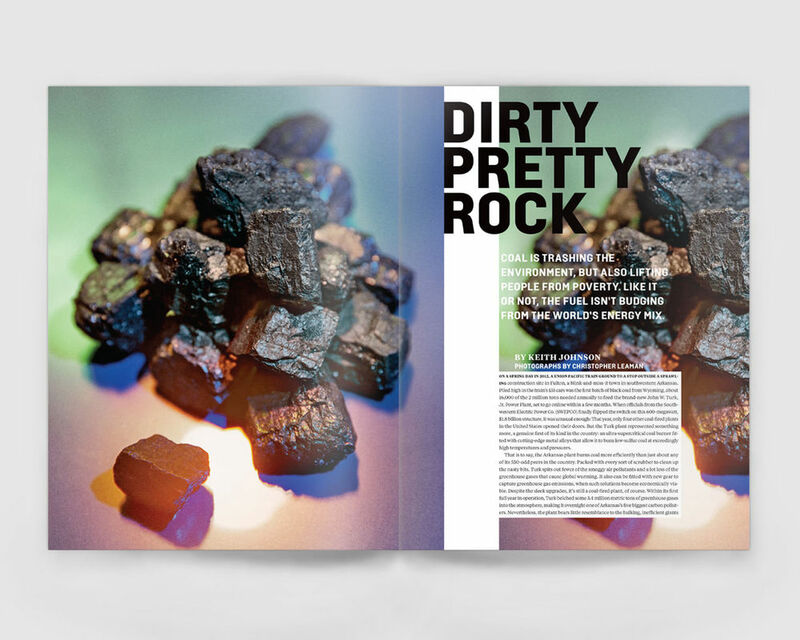 Flipping through the rest of the pages there’s find a commitment to a stronger visual presence, in both form and content—wider margins and white space allow both image and text to breathe. A cohesive type direction and the red, black, white and gray color palette straddles the line between modern and classic. Most importantly, though, are the introduction of new departments such as “Visual Statement” and “Aperture”—where artists and photographers are invited not only to be accompaniment for the written word, but they are authors themselves, giving them equal billing with edit. It was a great experience made only possible by having visionary editors to collaborate with. 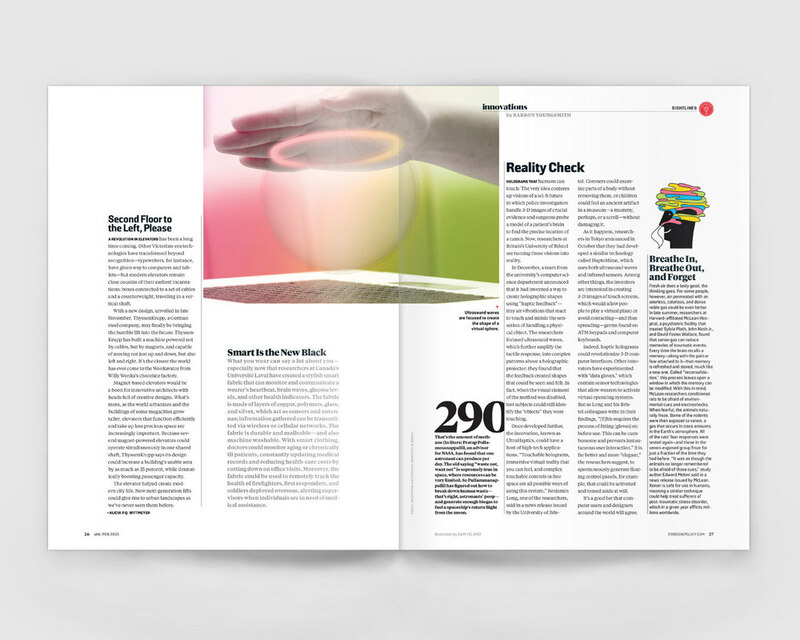 Our redesign set a new standard for the magazine, as the creative industry recognized FP as a platform for important, inspiring work. 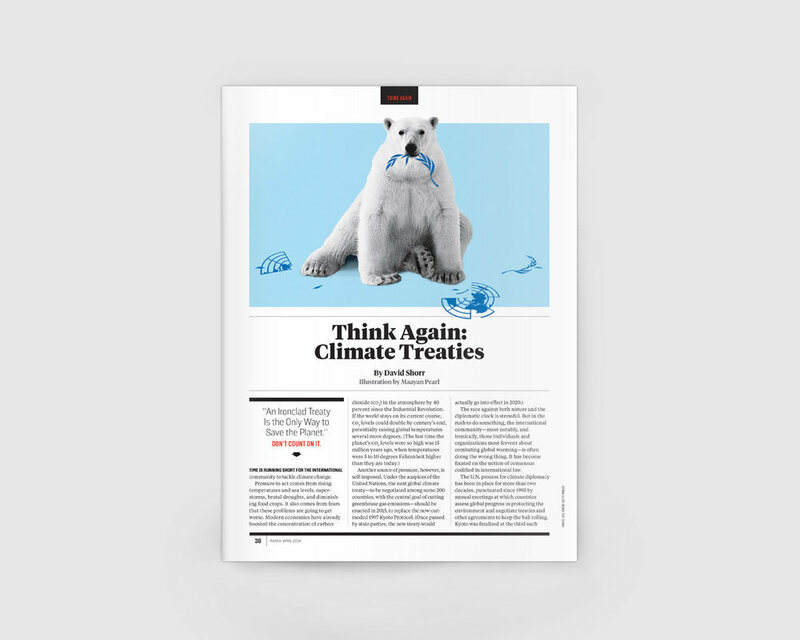 One of Foreign Policy’s marquee brands is their annual Global Thinkers issue—a special year-end package, a widely cited list and event which highlights 100 of the world’s preeminent thought leaders—activists, artists, musicians, scientists, writers, politicians, entrepreneurs, documentarians, and public figures—of that year. 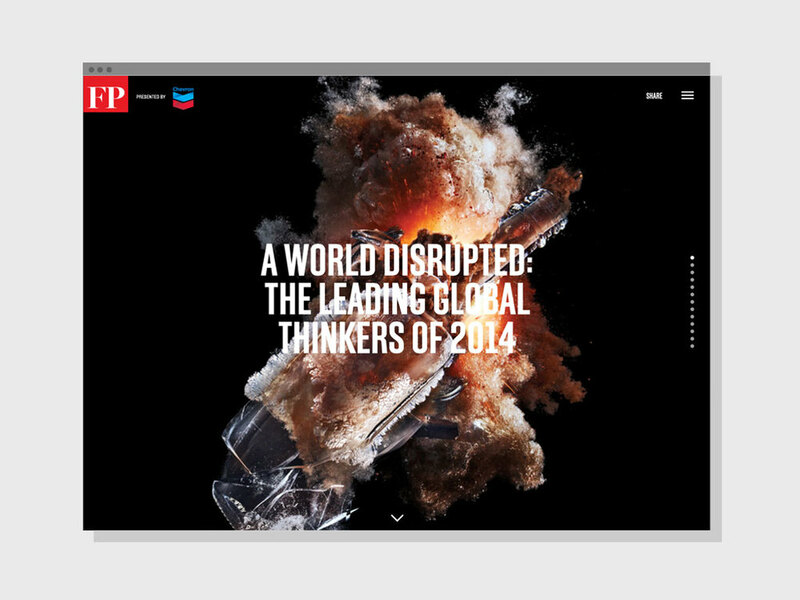 For the sixth annual Global Thinkers, we tied the theme of “A World Disrupted” together (in print, in motion, and on screen) with an accompanying microsite and video component for the annual Global Thinkers Gala held in Washington, DC. 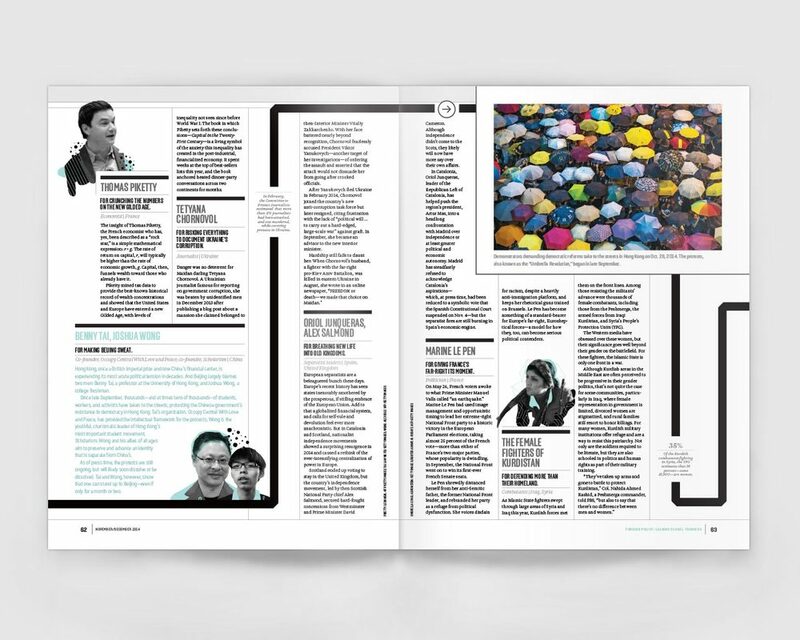 Our work with Brooklyn-based WeShouldDoItAll, who took our initial graphic language and designed and developed the Global Thinkers microsite, earned a silver medal from the Society of Publication Designers in 2015. More about the process behind the explosion photography by Amsterdam-based photographer Marcel Christ can be found here (note: the cover took 15 takes). When I first started at FP, one of our initial undertakings was a much-needed redesign of the website. As FP’s site hadn’t been redesigned in over 7 years, we had a virtual blank slate to work from. We had two guiding principles: establishing clarity for the user, and more emphasis on imagery to broaden the appeal of stories. We started by stripping down and simplifying with a modular, responsive framework. 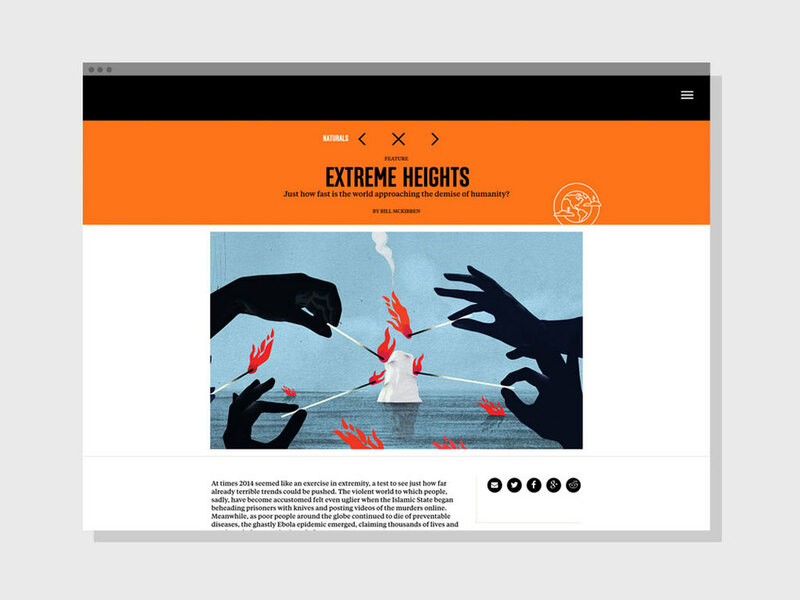 The top nav drop-down menu streamlined the navigation, allowing readers to access topics and favorite columnists quickly. 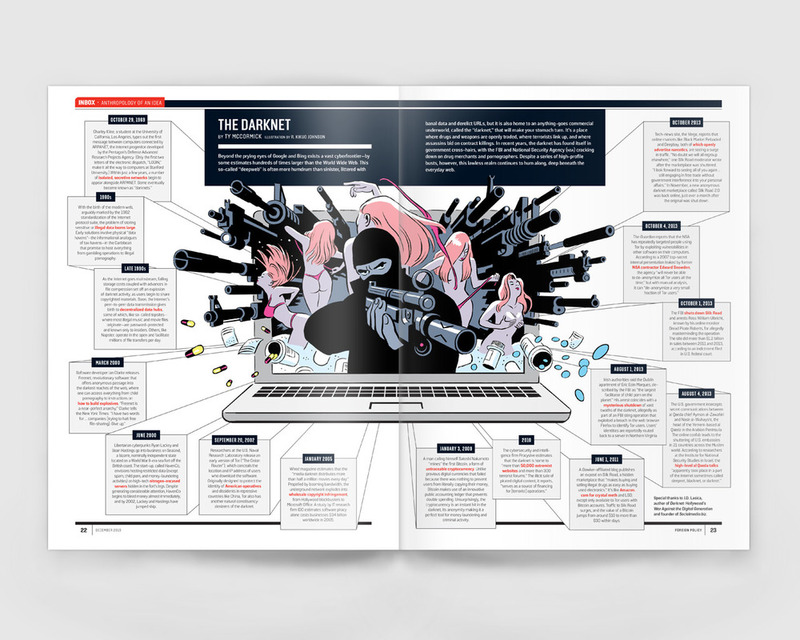 The pages for topics acted as a mini-homepage for users looking to delve into a particular area of expertise. For more robust pieces, we created a parallax scrolling template with a variety of plug-and-play tools (e.g. galleries, sidebars, maps) that can be added in when appropriate. 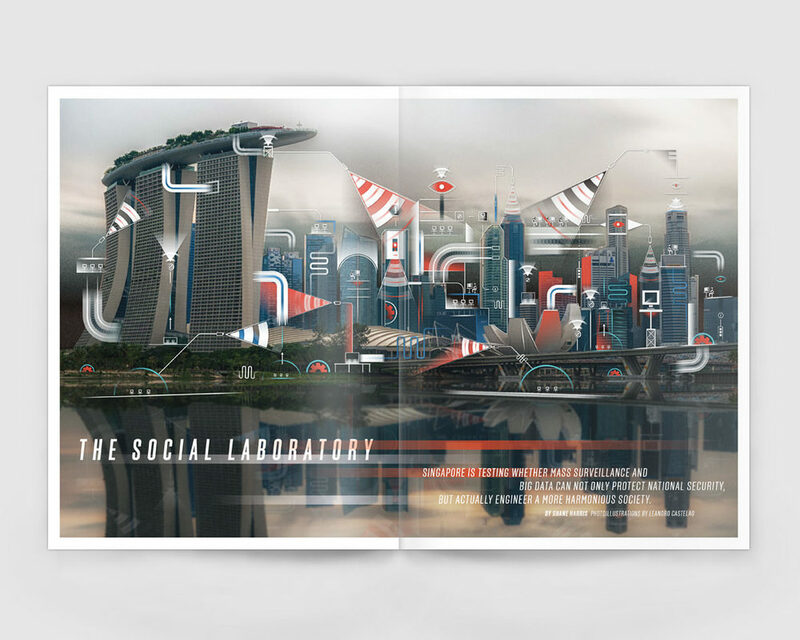 In addition, we established brand identities for FP’s most popular news brands and partner channels.